BEAVER — UPDATE 5:45 p.m: The suspect who has been involved in a standoff with UHP, Iron County SWAT and others since around 1:30 p.m. Sunday is in custody and nobody has been injured, according to a tweet by the spokesman for the Department of Public Safety. The tweet also stated: “Child is OK.” No further details are provided at this time. SEE VIDEO of suspect surrender, courtesy of Charles Triplett, public information officer for Beaver County Sheriff Cameron Noel, click Post by Cameron M. Noel. Video is by Noel. 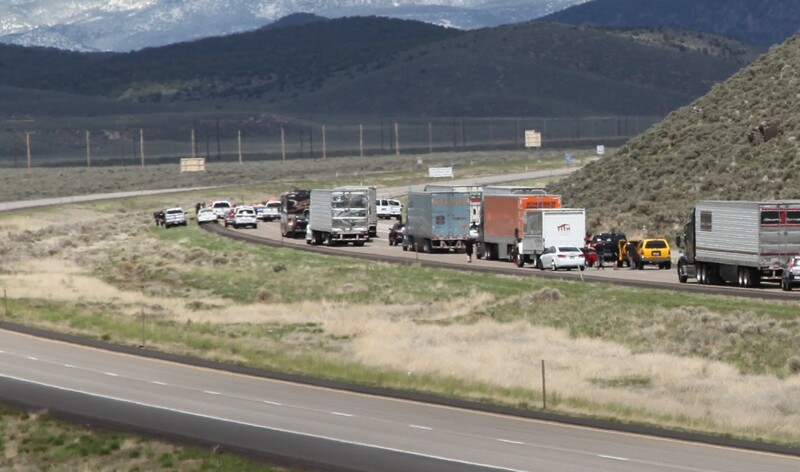 Both directions of traffic have been closed throughout the afternoon on Interstate 15 in the area of mile post 95 between Beaver and Parowan due to law enforcement standoff incident in progress. 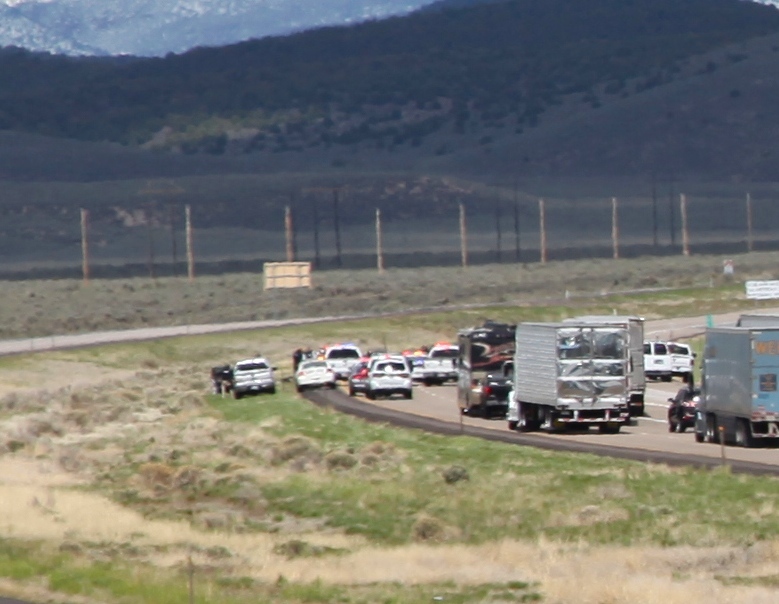 By 1:30 p.m. Sunday, Iron County SWAT teams arrived to assist police and Utah Highway Patrol troopers with a standoff incident just off the freeway. As of 1:40 p.m. officers were negotiating with a suspect in the standoff who is claiming that he has high-powered guns in the car and is threatening to use them. Iron County Sheriff’s Office released a statement just before 4 p.m. relating the precipitating events, set forth below. 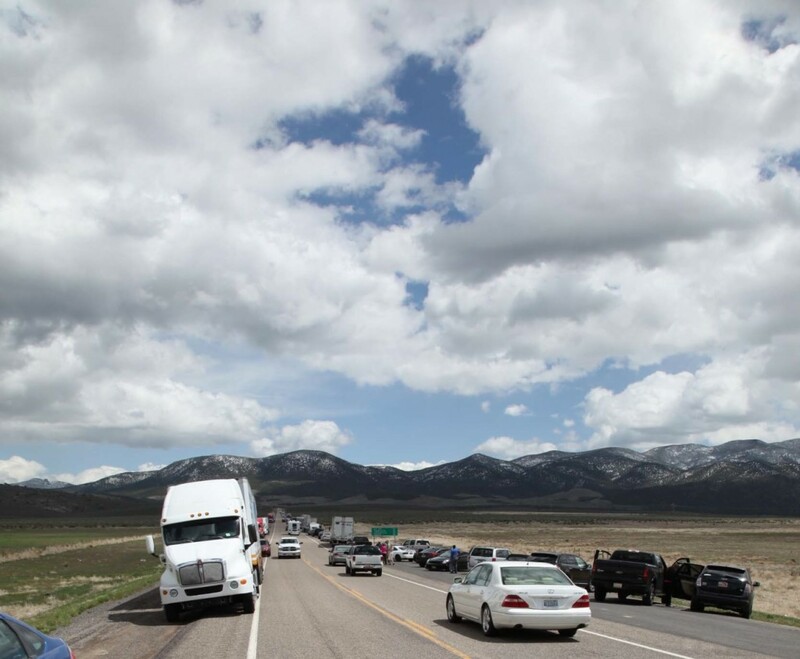 Traffic impacts – updated 6:19 p.m.
UPDATE: Utah Department of Transportation has posted on its website that northbound I-15 is now open, expect delays. 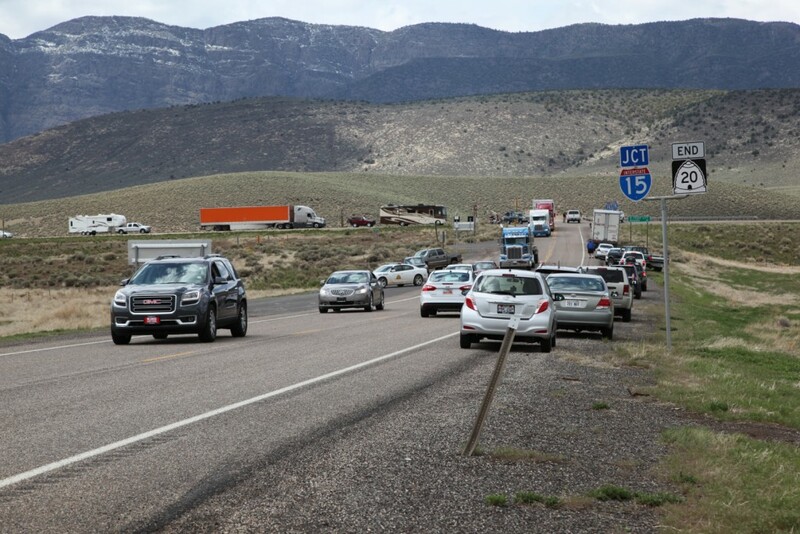 All southbound traffic on I-15 has been diverted at Exit 112 throughout the standoff from Beaver onto Route 21 and then Route 130 through Minersville and back to I-15; at 5:56 p.m. UDOT tweeted that southbound I-15 is now open. Northbound traffic has been removed from I-15 at state Route 20 to northbound U.S. 89 and then to I-70 throughout the standoff; at 6:19 p.m. UDOT’s traffic website has been updated to indicate northbound lanes are open, expect delays. 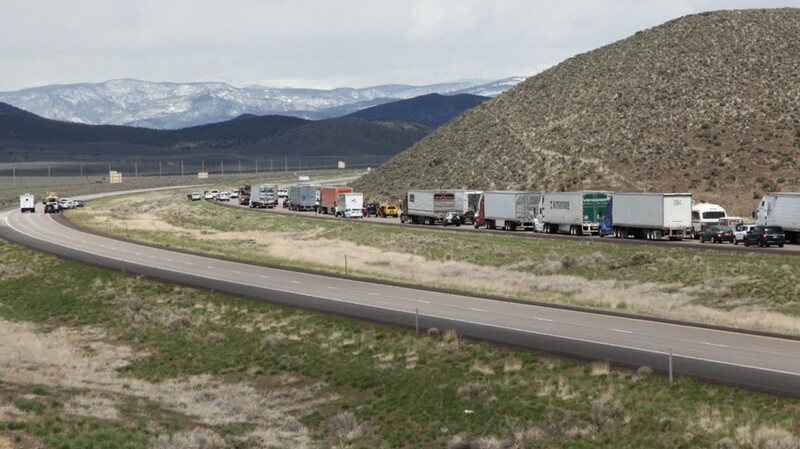 At approximately 4:45 p.m. St. George resident Violet Gross was traveling southbound on the detour through Minersville and said that traffic surrounding the towns of Minersville, Enoch, and Cedar City had slowed to a crawl. Traffic was log jammed long periods of time through Enoch and Cedar City specifically. 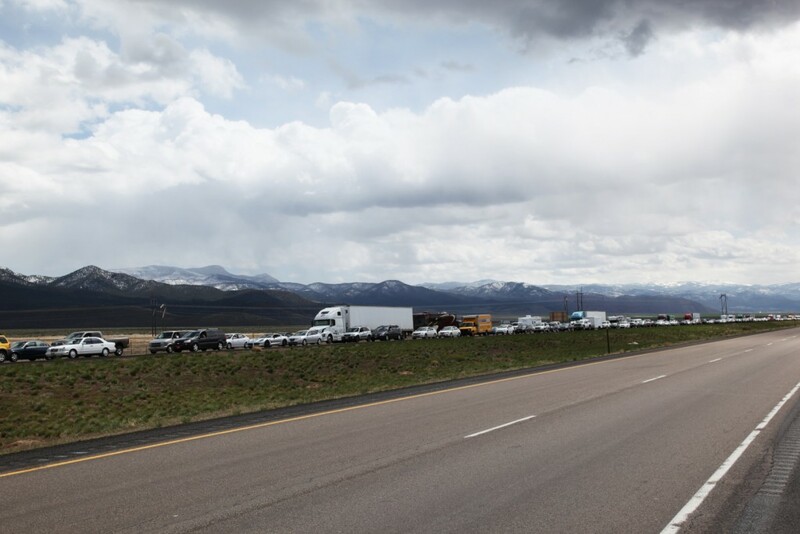 Once back on the freeway in Cedar City at 5:30 p.m. southbound, traffic was moving at normal speeds. Northbound traffic stopped at the point of the incident before traffic detours were in place stood at a standstill, backed from the point of the incident as far as mile post 88, as of 3:30 p.m.
At around noon Sunday, Cedar Communications advised the Iron County Sheriff’s Office of two suspects wanted from the Louisiana area. According to a statement issued by the Sheriff’s Office by email at 3:52 p.m. Sunday, a search for the vehicle by officers started and a vehicle was located with the occupants matching the persons wanted for questioning. A third subject took off in the vehicle with a small child. A pursuit was initiated with speeds reaching 130 mph. The vehicle was then spiked near mile post 95 and the vehicle came to a stop after striking another vehicle. It is believed the occupants of the second vehicle were uninjured. The subject in the suspect vehicle is holding the small child and not releasing him. The Iron County Sheriff’s SWAT team along with the Iron Metro SWAT team are on scene with negotiations ongoing. The goal in any #standoff situation is to achieve a peaceful outcome. That is what negotiators are working for. Still ongoing situation. Negotiators are working on a peaceful outcome, traffic is still being diverted. Update: NB/SB I-15 closed MP 95. Follow detours. NB traf approx 7 mi backups. SB traffic minor delay. UPDATES: This post is being updated continuously as this incident unfolds. Refresh the page for updates. Ed. Notes: This report is based on preliminary information by law enforcement, other agencies and available radio transmissions and Internet feeds, and does not contain the full scope of findings. This is a developing incident with public safety concerns and traffic impacts. Do the editors realize that reposting statements heard on the police radios is illegal? Blabap if you read the story there are no quotes from police radios. That is even assuming that it is illegal to do so. The quotes are from police news releases and tweets. Get a sharpshooter out there and remove this guy. People have places to go. Hope you’re moving, Bobby M – SB and NB are now open. Refresh post for updates. Way to stand up against the gubment! These people are patriots!! Murika!! Sure. Wanted for murder in Louisiana according to TV. “Negotiations are under way over the phone with the man, whose tires were spiked after a pursuit. Wouldn’t that be, “tires were spiked during the pursuit”? Perhaps, Not surprised; but we never alter direct quotes – written or spoken, not in the slightest even to the peskiest typo.